IBASSIN: 2019 FLW Tour Cherokee Lake Day 3: Andrew Upshaw Close to Win with 52-04lbs! With that in mind, Upshaw plans to change things up on Championship Sunday. Instead of starting the morning in the same place, despite the prospect of lesser boat traffic due to the 10-boat field, he plans on running a new pattern to try to catch a limit while his fish re-settle from the early-morning water disruption. Catching big ones is the name of the game, but Upshaw knows it starts with getting five fish in the box. He wants to get on them early, if for no other reason than to lift that weight off his shoulders. When you lead wire-to-wire through three days, it’s safe to say things have pretty much gone according to plan. As long as his new game plan pans out Sunday, there’s very little stopping Upshaw from making it four in a row for his first Tour win. Sixteen-year Tour vet Tom Monsoor bucked the trend of fishing for bedding smallmouth with finesse tackle this week, opting instead for old faithful – a swim jig he made himself. That little white swim jig paid off Saturday to the tune of the biggest bag of the day, a 17-6 stringer full of smallmouths. Part of what precipitated Monsoor’s big day was fishing a new area he hadn’t fished since the practice period. It was a large cut at the south end of the lake that held a few big fish that were in the right place to hammer his jig. Within about 20 minutes, Monsoor had three sizeable keepers in his box to cull out some dinks, all from that stretch. He plans to start there again tomorrow, but he’s a little concerned about the fact that the fish he caught in that section of the lake seem to have spawned out already. Monsoor says he’ll try again in that area Sunday, but he’s ready to run up the lake for prespawners or bedding fish if that pattern dries up. After keeping his fishing location under wraps much of the week, Dylan Hays was finally ready to discuss the strategy that has him in third place entering day four: flipping for big green bass way up in the Holston River. It’s a pattern that almost no one else got on this week, either because of how good the smallmouth fishing has been or because it takes a little while to make the run up to where the river feeds into the lake. Hays started his practice up the river, but after checking in with other Tour pros (who were all hammering on brown fish in the main lake), he decided to give that a go for a couple days. It didn’t quite pan out, so he went back to where his week started. “The only reason I did it was because I couldn’t get the smallmouth going,” he admits. “I started practice up there [in the river] and the first bite I got like the fifth cast of the week I caught a 3 1/2-pounder, so I wanted to do that. From then on, it was all about catching the green ones, and Hays will stick to that plan tomorrow knowing he’ll have the river all to himself. As far as eventful days go, Grae Buck maybe had the most interesting of all the anglers who fished on day three. The three-year Tour pro wasn’t so much hunting fish as he was his own white whale. Early in the day, Buck found a smallmouth on a bed that threw his hook about 20 feet from the boat. He came back to that spot about 45 minutes later and tried again, this time getting the fish to within netting distance. What happened next was a great story whether he managed to weigh it in or not. It became personal at that point, and Buck once again returned to that spot about 45 minutes later. Buck had no quit in him, though, and he knew he might need that fish to make the top-10 cut. So, at 3:14 – just 16 minutes before check-in – Buck went back again and this time landed his 3-plus-pounder. With the half pound Buck culled, he ensconced himself firmly in the top five with a great chance to make some waves in the final round. Andy Young is just a man who loves fishing, especially when he’s fishing for smallmouths. 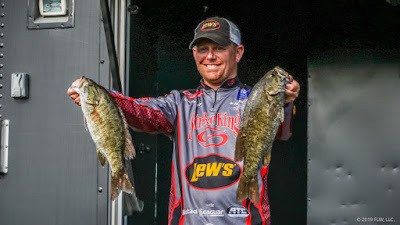 The Isle, Minn., pro has been crushing smallmouth all week, and he’s been doing it in mostly the same water, doing mostly the same things – targeting spawners with finesse tactics. Today, Young did run a little new water, but his pattern is so repeatable that it made it pretty easy to find new fish. “I did the same stuff all day,” he says. “I ran a lot of new stuff. I pretty much know what to look for, so you just drive until you see what you like and start fishing and they’re there. Young makes it look easy, but it’s anything but easy to fish well enough all week to do it again on Sunday. With potentially volatile weather moving in tomorrow, Young jokes that he’s looking forward to the challenge. With as good as the fishing has been on Cherokee this week, it really comes as no surprise that all 30 pros who fished on Saturday weighed in a limit. Fewer than 20 anglers failed to weigh in five fish on Thursday and even fewer than that struggled to land five keepers on day two. There isn’t much weight separating 1st from 10th, and it’s a good bet 10 limits tomorrow will make for an exciting final weigh-in. Forecasts called for more rain than was delivered on both days two and three of this event. With the exception of a couple isolated showers, it was downright beautiful most of Friday and Saturday. Still, the forecast is a little more ominous heading into Sunday, with multiple potentially severe storms expected to move into the area and stick around. Rain and wind haven’t done much to the bite to this point, but if it gets worse on Sunday, it’ll be interesting to see what it could do to the top 10 anglers’ weights. Less than 5 pounds separates 10th place (Tim Cales at 47-5) from first (Andrew Upshaw at 52-4). At the top, Tom Monsoor only trails by 1-10 and Dylan Hays is only 9 ounces behind him. Additionally, only 10 pounds, 3 ounces separated first from 30th this week, and 23 anglers caught at least 45 pounds over three days of fishing.